Solar energy is tax-free and readily available, even here in Wisconsin. Costs have come down on renewable energy systems. Right now there are statewide grants and low interest loans to help homeowners and businesses reduce their renewable energy installation costs. System Design: 36 Solar World 300-Watt mono modules (solar panels) were placed on an US Solar Mount Adjustable Ground Mound rack which allows for seasonal tilt, with 36 SolarEdge P320 DC Optimizers, connected to a SolarEdge SE10000A-US inverter which was then connected to a circuit breaker box. Placed in a field about 300 feet from the back door of the home, the line runs underground into the house, then is connected to the farm/house main electric service panel. The rack includes Array Dampner kits for tilt in windy conditions. The inverter converts Direct Current (DC) generated from the modules to Alternating Current (AC) which can readily be used for electricity needs on farm or, in the case of surplus generation, "stored" or "banked" back on the grid through "net metering." 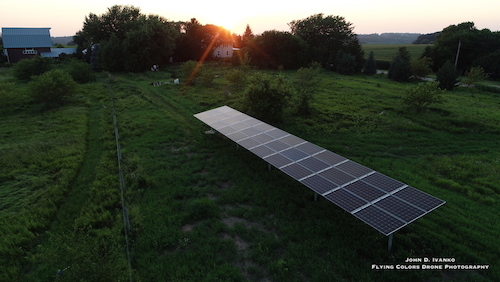 Type of PV System: Grid intertie with Alliant Energy which offers net metering, in essence allowing owners to sell excess electricity production back to the electric utility. Note: Currently, customers are only allowed to sell surplus at "wholesale" rate, not "retail" rate, significantly reducing any positive benefit to over-producing electricity (this is a new change by many utilities). No battery storage was employed. All electricity used at the Inn Serendipity farm is from 100-percent renewable energy. Annual Electricity Output: Projected 13,000 kWh/year. 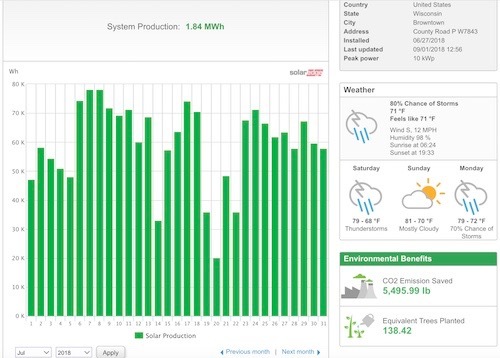 Click here for: complete PV output by year. Project Designers: Randy Faller, Kettle View Renewable Energy. The new PV system replaced the 10 kW Bergey wind turbine system. That wind turbine system is now owned by Kettle View Renewable Energy and the turbine is being rebuilt and reconditioned, then relisted for sale by Kettle View Renewable Energy. Ecological Impacts: Over the expected 25 year lifespan of the 10.8 kilowatt PV system, approximately 325,000 kWh of electricity will be generated from the sun to meet electricity needs at Inn Serendipity and other business activities for JDI Enterprises, Inc.; this will help avoid the emissions of about 533,233 pounds of carbon dioxide (CO2). CO2 is among the most common emissions from coal-fired electricity generation plants. Excessive CO2 emissions is the leading contributor to global warming. Use of Electricity: Use by Inn Serendipity B&B, FLYING COLORS Drone Cinematography+Photography, farm operations and recharging owners' Toyota Prius Prime plug-in hybrid car and other guests' plug-in vehicles (both Universal J1772 and Tesla Connectors) as a part of the Tesla Destination Charging program. Net investment may qualify for Federal Investment Tax Credit (30 percent) and/or be completely depreciated by the business in the same year as the equipment was put into service. Monitoring: Continuos monitoring via wireless radios, Engenius Wireless Bridge, mounted on the PV array. Sample solar electric output for month of July, 2018 is below. Site Integration: Integration of PV system to completely meet the annual energy needs of a diversified small-scale organic farming operation and home-based small business. PV System Funding Support: The 10.8 kW PV system is supported, in part, from funding from the Wisconsin Focus on Energy program. Comprehensive Farmstead Overview and Self-guided Booklet: Print out the 20 page booklet, The Good Life Guide: A self-guided tour of Inn Serendipity & the renewable energy systems that make it possible for a more detailed overview of the renewable energy systems employed on the farm over the years. This Guide does not reflect this new 10.8 kW PV system.